HomeParadise BlogParadise NewsWhat Has Dr. Helyne Been Up To? 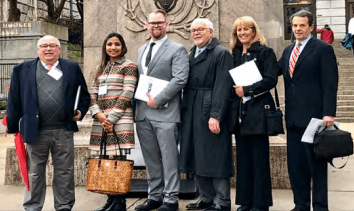 On April 25, more than 150 Massachusetts Dental Society (MDS) members, dentists and dental students took part in Beacon Hill Day, the Society’s annual lobbying day. Together, they filled the halls of the Massachusetts State House to meet with their state senators, representatives, and staff to discuss legislation impacting the profession of dentistry and the oral health of citizens across the Commonwealth. Dr. Helyne recently attended Mass Dental Society Annual Meeting. At this meeting, Dr. Helyne was named the new incoming Chairwoman of the North Shore Dental District by the House of Delegates! Dr. Helyne began to practice dentistry in 1993, right after having graduated from postdoctoral training in Periodontology at Boston University. She first began her career by receiving her B.A. in biochemistry from Brandeis University. After graduating here in 1987, she studied at Tufts University School of Dental Medicine, where she graduated in 1991. After this, she began working in a private practice for 8 years, before she joined her husband at Paradise Dental Associates in 2001. Need to Make a Dentist Appointment? At Paradise Dental, we want to make sure that all of our patients are taken care of with the utmost of quality. We offer specialty services and Doctors to accommodate your full dental needs and make for a great experience, given any age. Contact us today for more information or give us a call directly at 781-598-3700.